Ah, yes, duo roller blinds. Who can resist their charm? Those modern, classic, chic stripes which allow for natural light to enter as well as privacy at night. Duo Roller Blinds come in a huge selection of neutral tones. They are also available in bright reds, blues, and platinum. You’ll be sure to find the right color for your space. Delicate, soft, stunning. Bold, modern, striking. But Are They For You??? Yes AND no. Duo roller blinds are perfect where they will be seen and not touched. 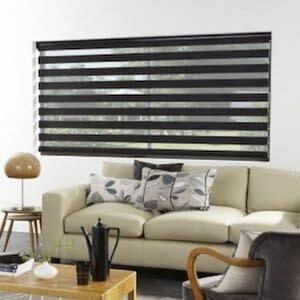 If you’ve got little people with sticky fingers running through your house, pulling on window coverings then have a second thought about these blinds. Sliding doors are not an ideal location for Duo Roller Blinds. They are meant to be left down, adjusted slightly to either “open” or “privacy” positions. They’re not meant to be pulled all the way up each day or it will put a strain on this delicate material. They really make a statement in your room that screams something different than the norm. 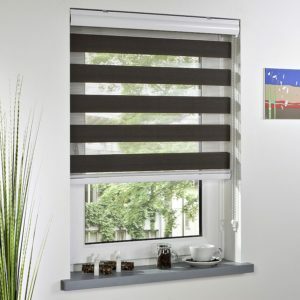 Customers describe the duo roller blind as somewhere between a curtain and a blind. They have a beautiful textured fabric that resembles something you’d find in a curtain but the gentle sophistication and ease of a blind. They add softness and style and make an eye-catching statement. We were in Cape Town in December and walked past a restaurant by the sea in Simon’s Town. They had two windows worth of walls in duo roller blinds and they looked haggard and tattered. The harsh sea air had destroyed them. You could tell they had endured years of misuse by customers and staff members. The Duo Roller Blinds were filthy and gross and I thanked the Heavens that I hadn’t sold them to that restaurant. This is why we at The Decor Connection are so conscientious about where we sell these blinds. We would rather not put our name next to something we know is not going to last. If we feel it’s not right for you or your space, we will be honest and show you something else that’s more practical. Duo Roller blinds come in many different contemporary textures and fabrics. Some are more earthy and some more modern and contemporary. The sheer layer comes in either a black or white, to perfectly contrast the colored stripes. We recently put a duo roller blind into a customer’s kitchen. We spoke to the customer about the pros and cons of this elegant blind so close to food splatter and water splashes. She decided that it would be suitable in her kitchen so we were happy to sell it to her. 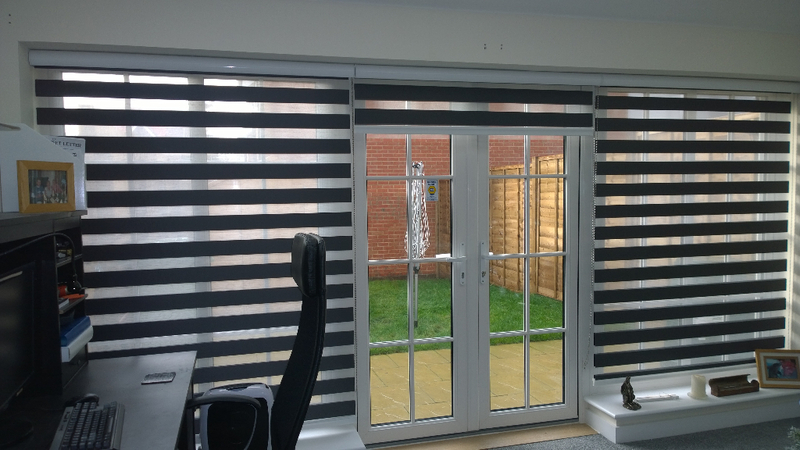 We have no problem installing a blind wherever our customer wants it, given that we’ve discussed all aspects. Whenever a customer calls us, we will give you our honest opinion, even if it means we don’t make the sale. We’d rather know you picked the best choice for your space.